It’s quiet on this western front, but it’s not that quiet. It’s cold but not that cold and it just won’t rain. The green will not come, the brown will not go, and every time the sky clouds over, it brightens up again. I’ve been assured the quiet months really do come to wineries, but they haven’t come yet. 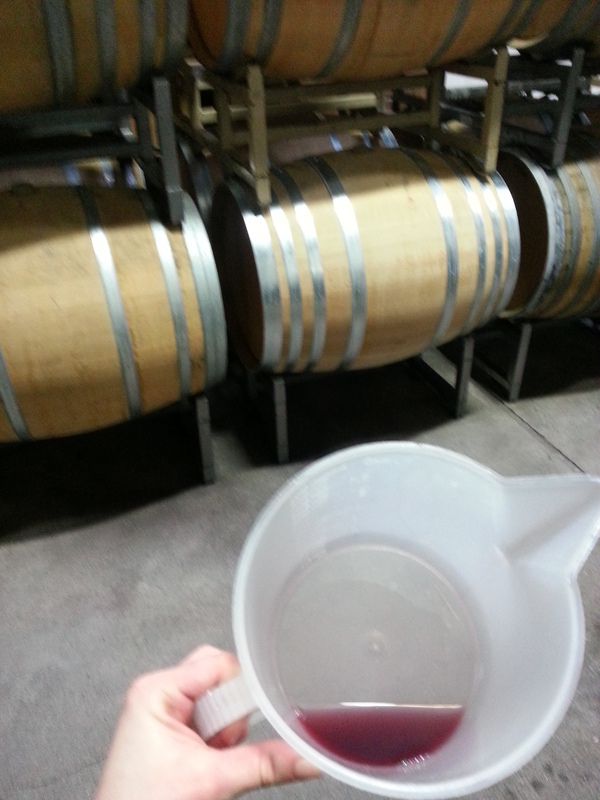 We have five batches of wine still finishing the last drops of malolactic fermentation – a couple whites and one red. I’ve spent whole afternoons filling the barrel room and I’m still nooooot quiiittteee there, and I may go mad before I get it all in there. I’ve measured the barrel room out to within an inch of its life, I’ve counted and recounted, I’ve moved and removed, all in the hopes of making the space as coherent and workable an environment as possible – for me. That’s the reason. I am the one who has the great privilege of spending the rest of the year topping, sampling, stirring, sulphuring, racking, and just being in that smallish, big room. 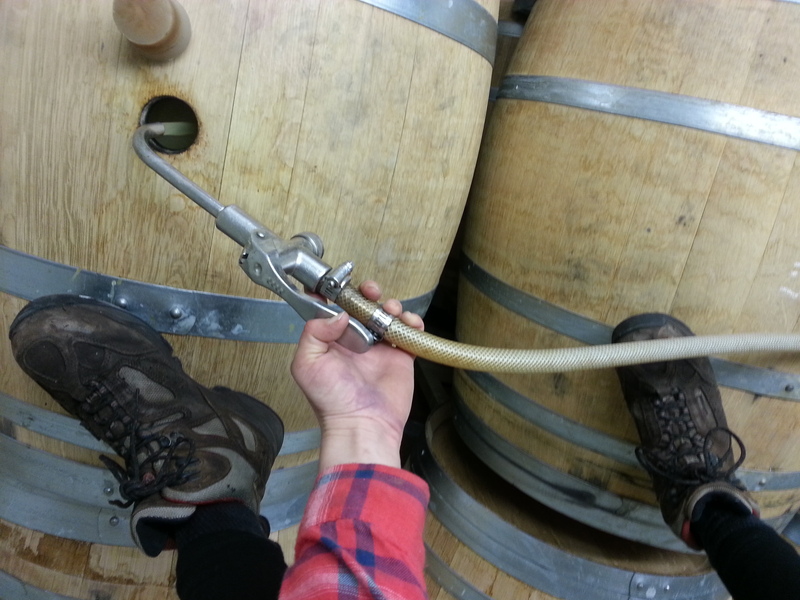 Working with the barrels, looking for things, hosting tastings . . . I’m trying to get the most mileage out of it for my own sanity. And happiness. It’s hard to get on top of all the organization because we are still juggling a lot, and now – and for the duration – we are juggling a lot a lot of wine. There is so much wine to top, so much wine to conduct analysis on, so much wine to taste in preparation for major blending decisions, so much to prepare for our spring bottling, so much wine work on the calendar, and so much still to catch up on and plan for the weeks and months to come. It only recently occurred to me that I have yet, since returning to Donelan last summer, to find a day boring. Joe and I have scheduled up the next month of work already, and it’s jam packed. with the blending decisions to be finalized in the next month, we’re doing a lot of tasting and trialling. We will bottle the Two Brothers Pinot Noir, the Cuvee Moriah Grenache-Syrah-Mouvedre, and are making core blending decisions on the Walker Vine Hill Syrah and the Cuvee Keltie Syrah. Many calls to make. The feeling of harvest buzz, post-harvest hustle, and pre-holidays bustle has turned into a seemingly endless new year worth of action. I’m into it. My next post will be from an exciting, mystery location that will involve a winter coat, a plane trip, and formal wear. Stay tuned. Hi I just found your blog and I love your posts! It’s great getting a female perspective on the experiences of working a harvest. I was wondering if you ever found the “must be able to lift 50lbs daily” encumbering?